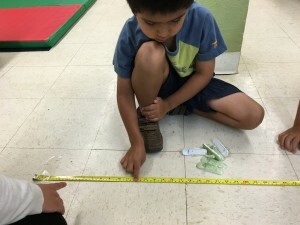 Measurements are found everywhere in our daily lives from telling the temperature of a child to the ingredients in a recipe to science engineering. 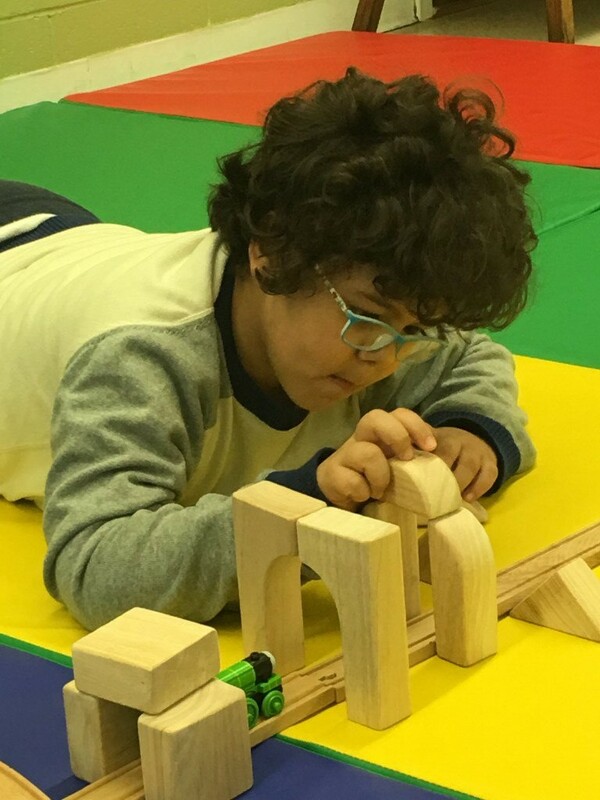 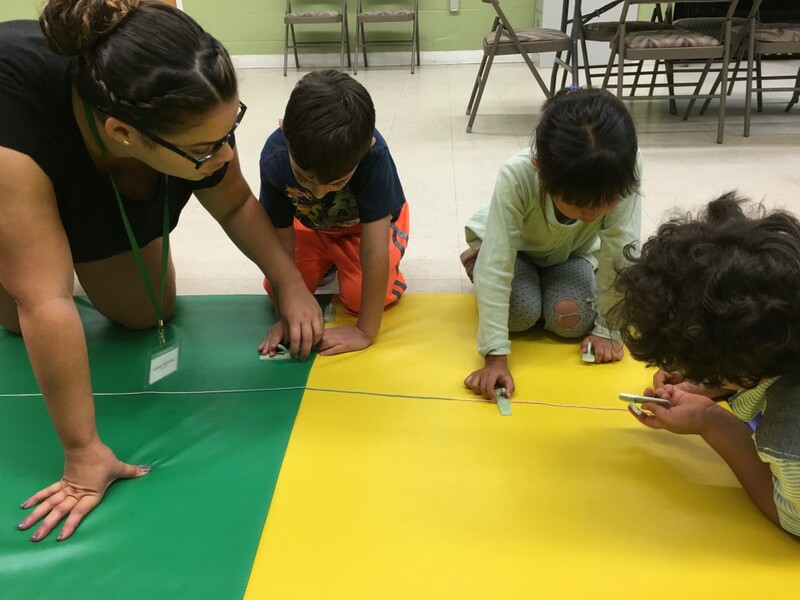 This month we taught the children how to use various measuring tools. 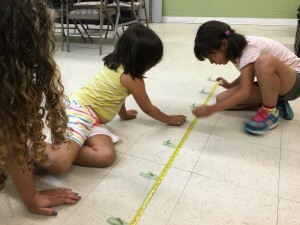 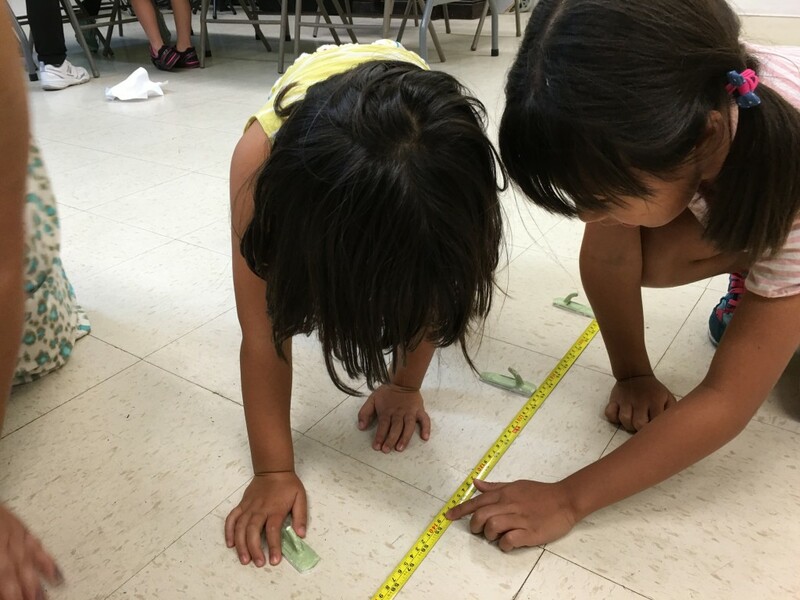 It was a chance for them to learn mathematical accuracy to put numerical value to quantify what they see instead of using vague terms such as small, big, short, tall, and so forth. 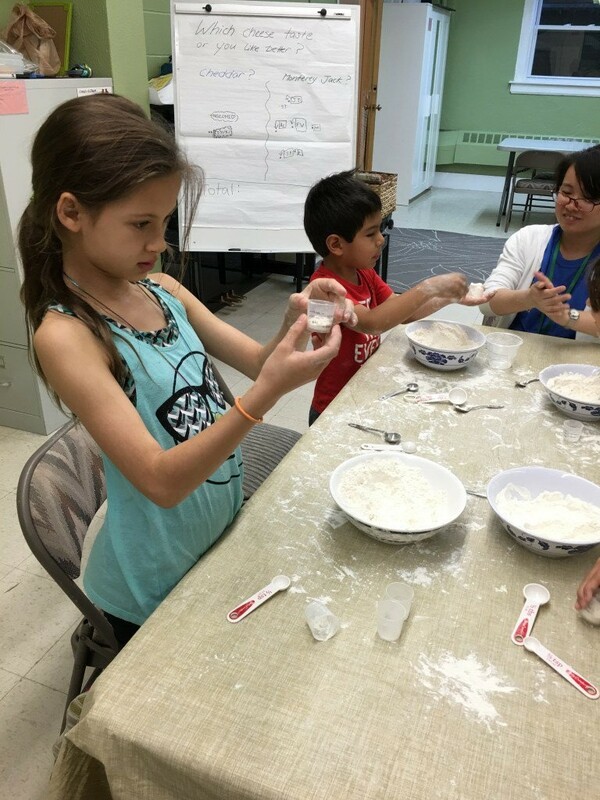 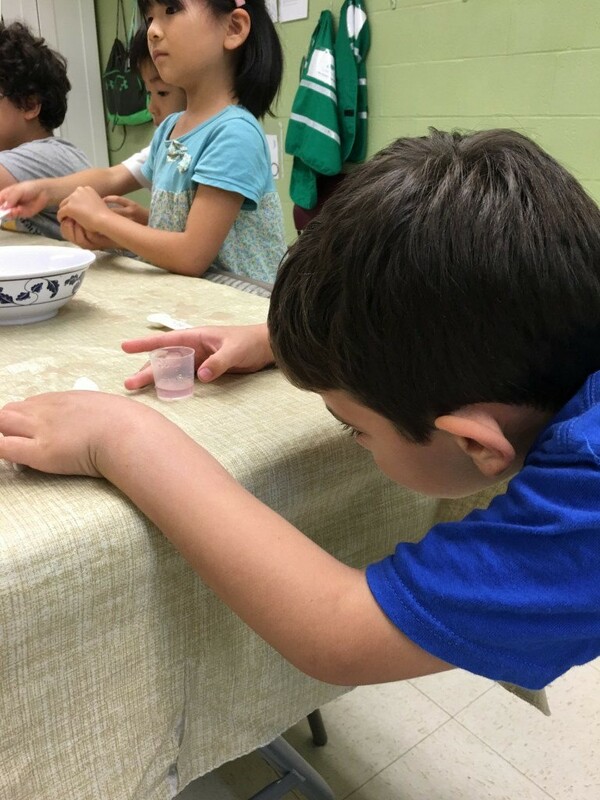 At Lin Learning Center, we encourage our students to think about measurements in their snack preparation such as the amount of cream cheese in a packet and how much of it each child needs for their bagels with strawberries. We also had the children participate in various challenge activities. 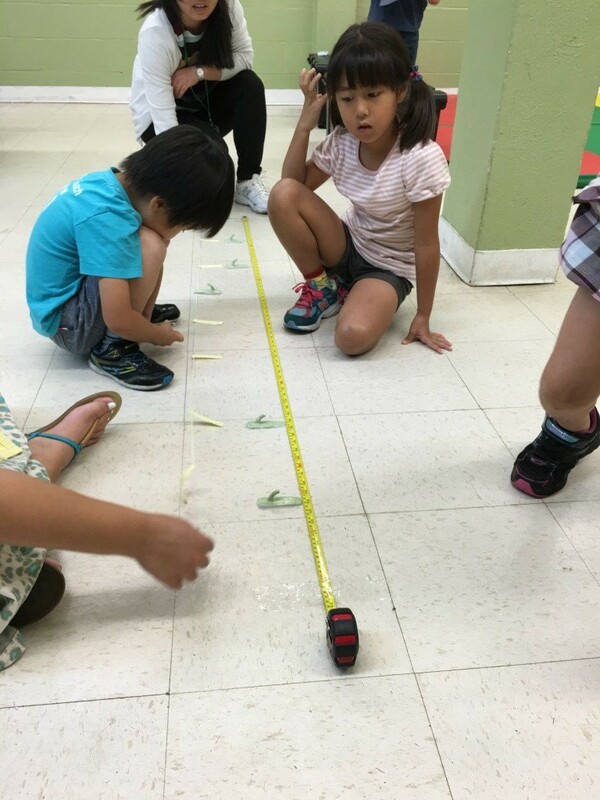 Throughout these exercises, the children had fun engaging and learning about the subject of measurement. 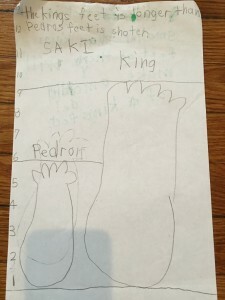 Once upon a time a king wanted to give a bed to his queen for a birthday gift. 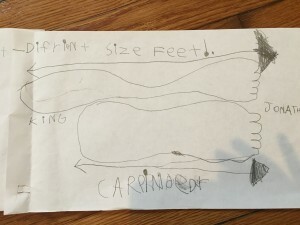 To make sure it fit her, he measured her by his feet and instructed a carpenter to make the bed by that length. 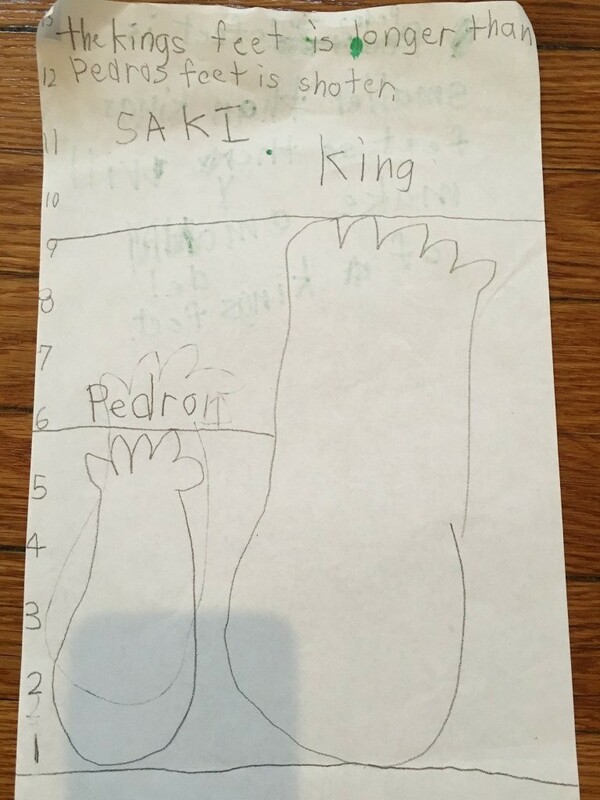 However, when the carpenter delivered the bed it was too short, so the king threw the carpenter in jail. 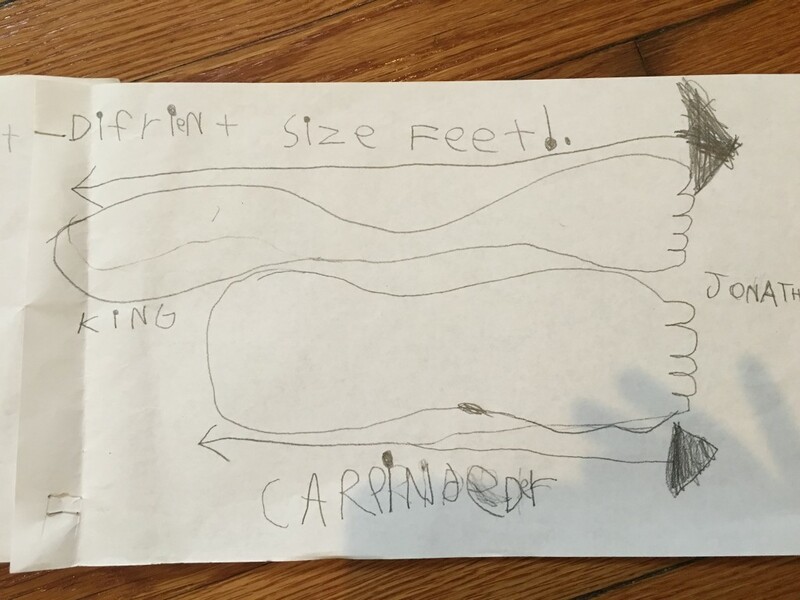 The carpenter didn’t understand why the bed had come up short since he measured it as requested. 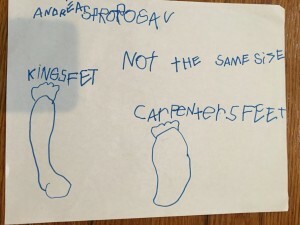 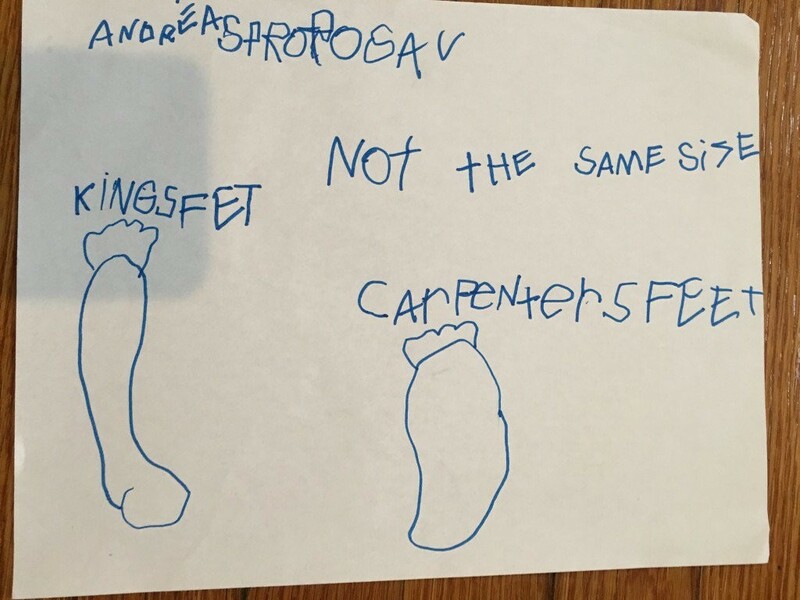 Using writing and/or drawings, Andrea, Jonathan, Spencer, and Saki participated in the challenge. 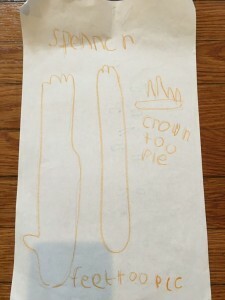 “If the queen takes off her crown then the bed will fit her,” Spencer remarked. 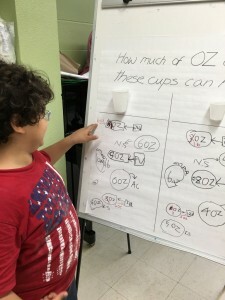 Challenge Two: How many ounces of liquid can each cup hold? We gave the children different tablespoons and teaspoons to look at. 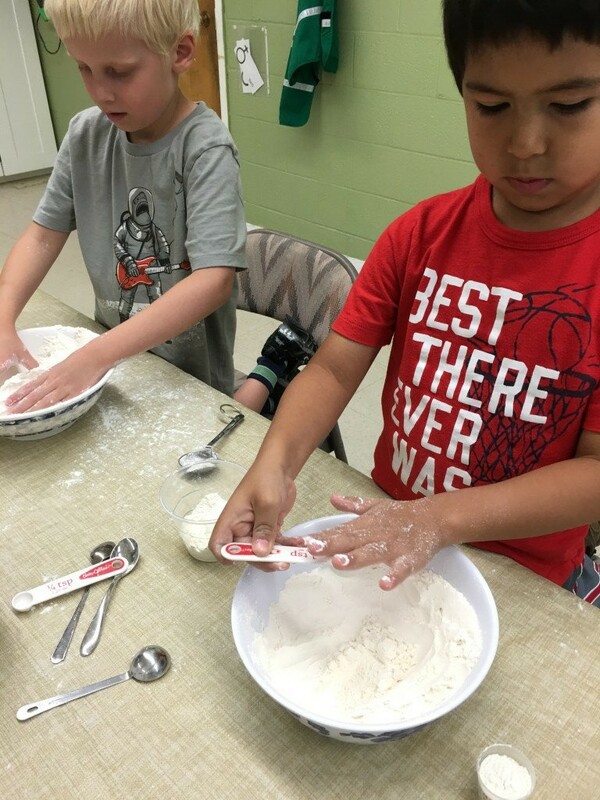 They noticed the utensils were not all shaped the same, thus it would be difficult to make a generalization without a specific measurement. 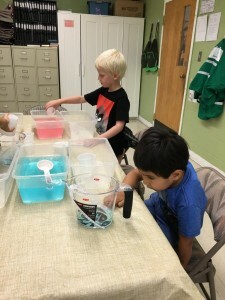 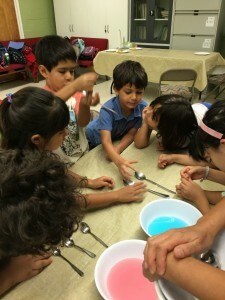 The children explored the various measuring tools with colored water and flour. 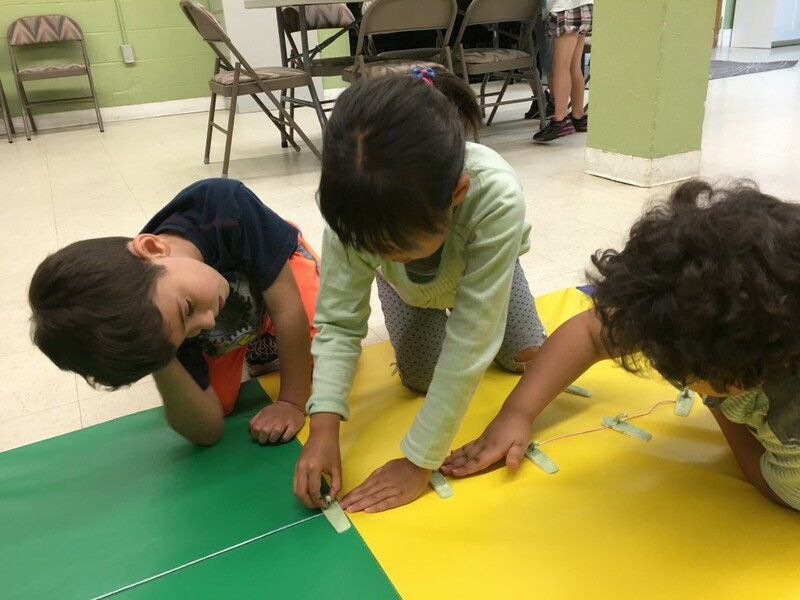 At first, it was simple fun, but over time the children began to identify the numbers, symbols, and lines on the measuring tools. Spencer demonstrated leveling out flour in his spoon to be exact. 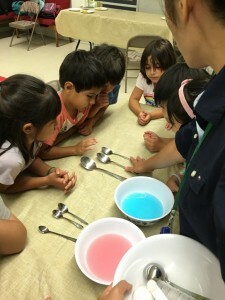 Saki noticed that four ¼ teaspoons makes one teaspoon. 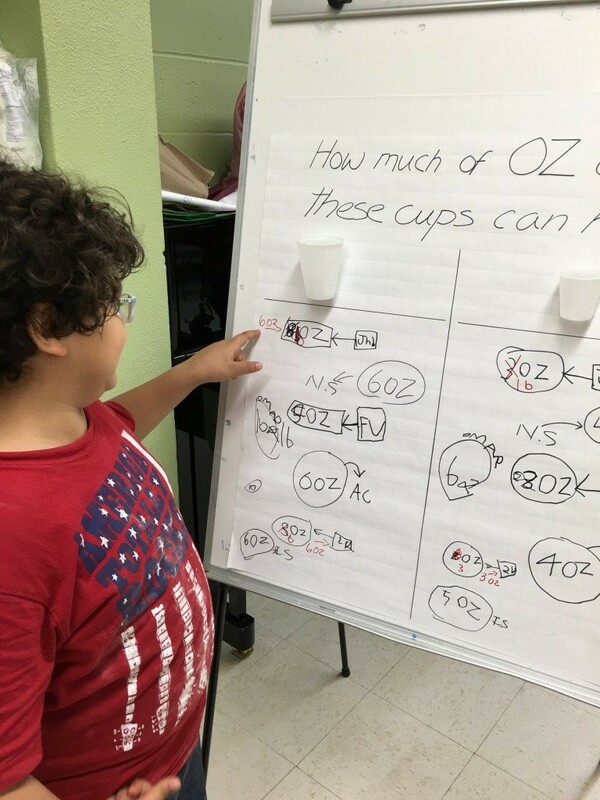 After weeks of exploration, we asked the children to guess how many ounces can fit into two presented cups. 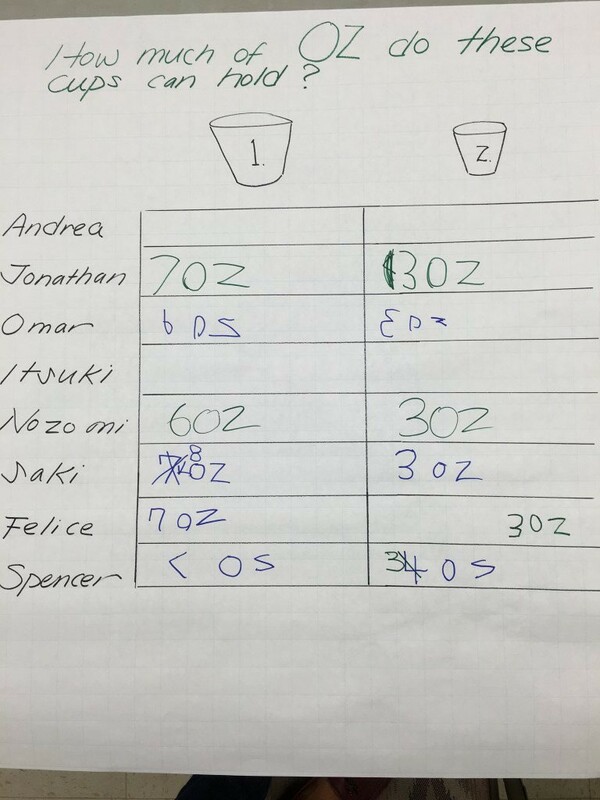 To help with this, we had a chart to collect the guesses and we also allowed the children to change their guess after the actual trial. 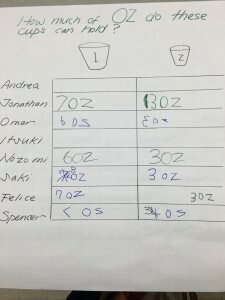 Then we had a final chart where the children put their answers after using their best techniques to measure. Most of the children were very close or exact with their measurements. 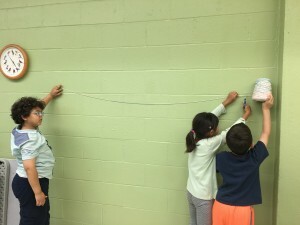 We had the children participate in placing eight hooks on the wall. Using string, they measured the space they wanted to cover. Then they placed the string on the floor to arrange the hooks on, and we discussed how far apart each hook should be. 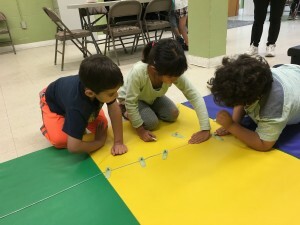 Initially, the children placed the hooks along the length of string at random, but they noted the hooks were not evenly placed. 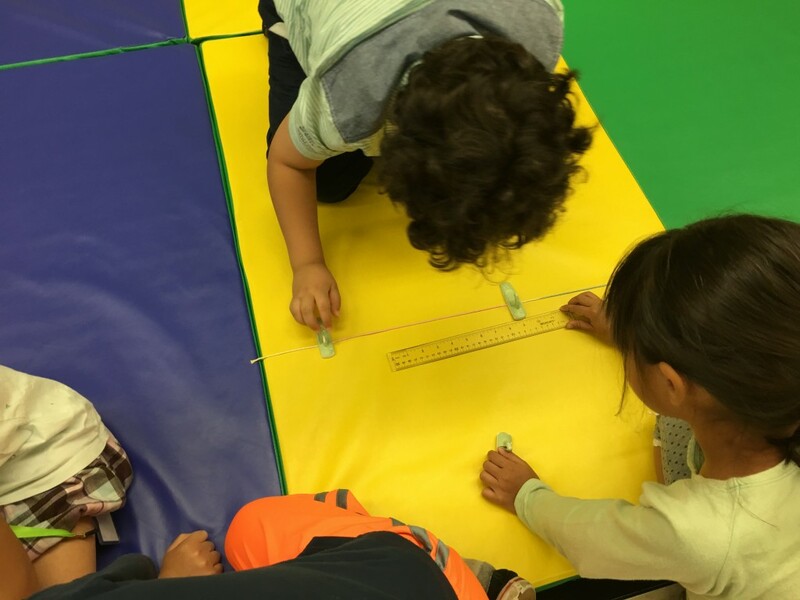 Saki came up with the idea to use her hand length to place each hook equally apart. Using this technique we placed each hook evenly along the string, but that had too much string left over. 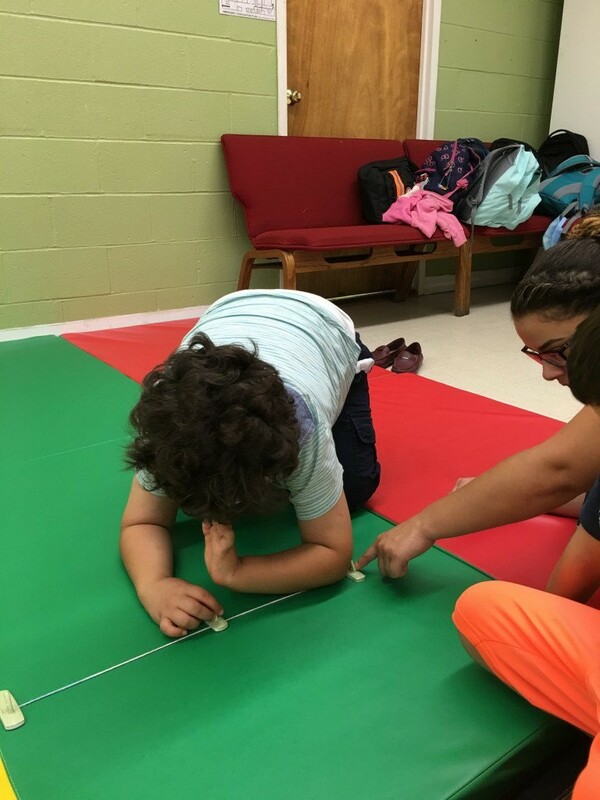 Jonathan suggested that Saki’s hand was not long enough and that we needed something longer. 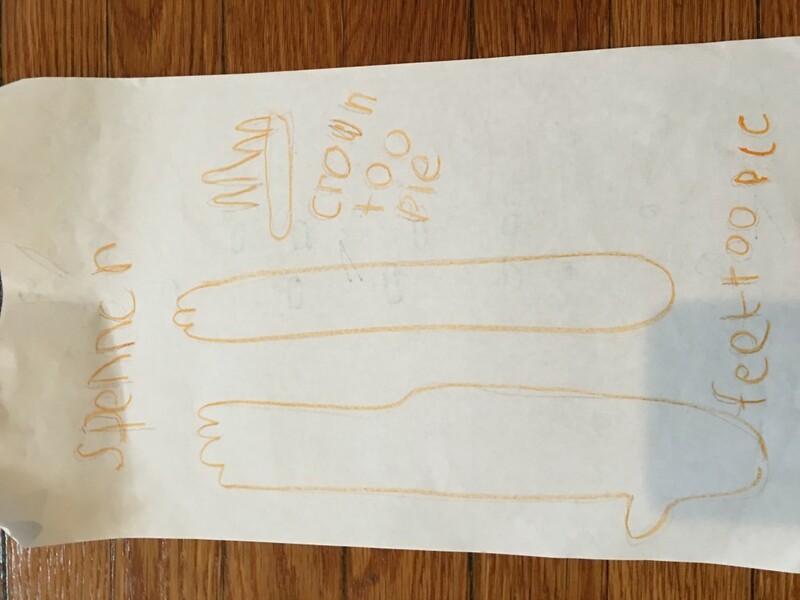 Thus he came up with using his forearm length. With this method, we were able to place each hook equally along the entire length of string. To quantify the actual distance, we also measured it with the ruler. 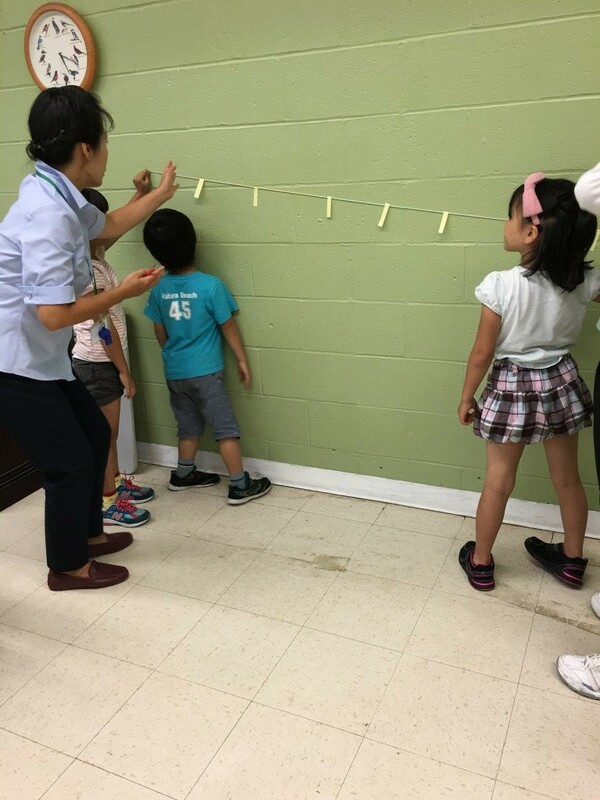 Thanks to our children, we have hooks placed on the wall to hang things. 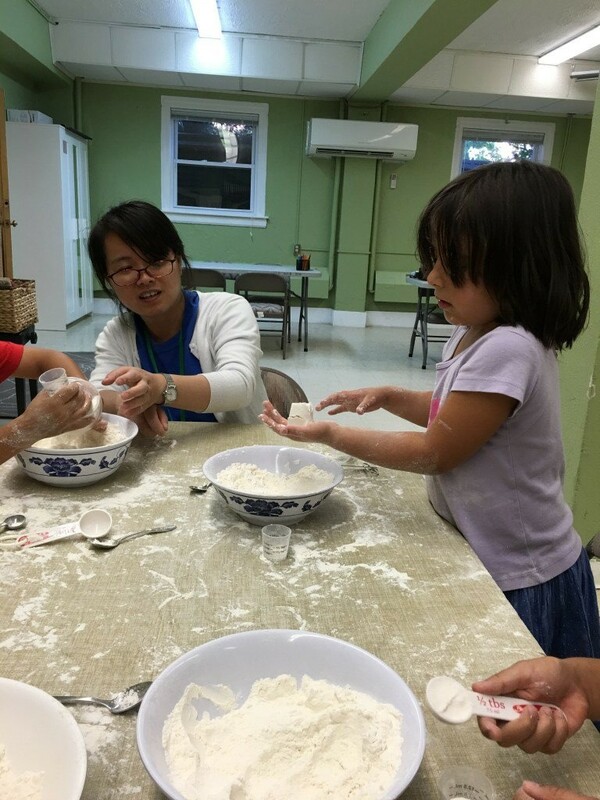 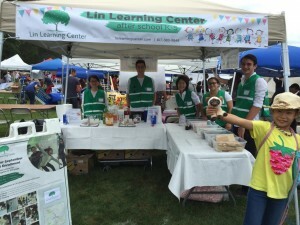 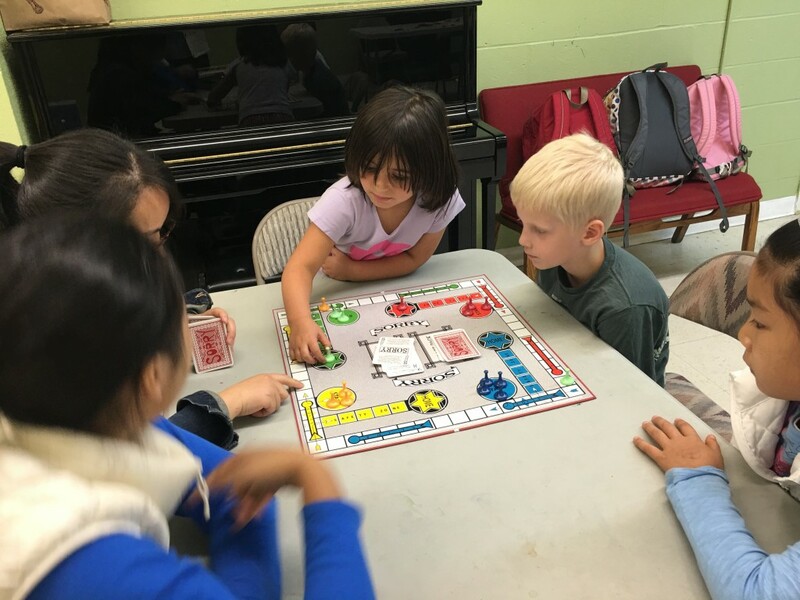 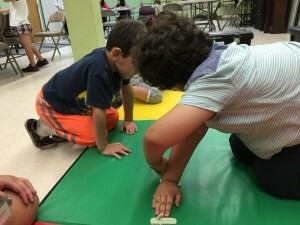 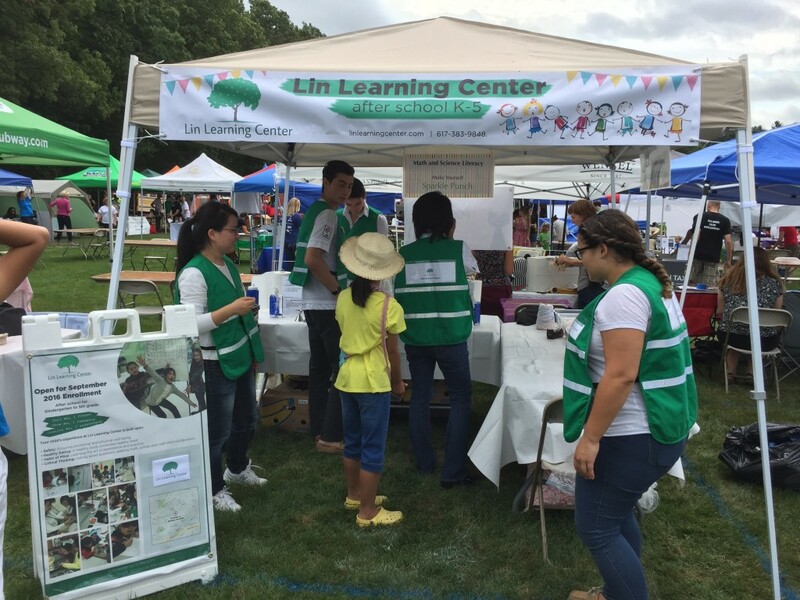 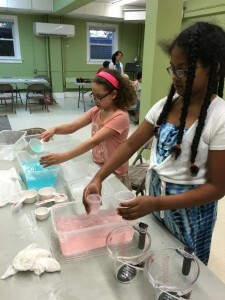 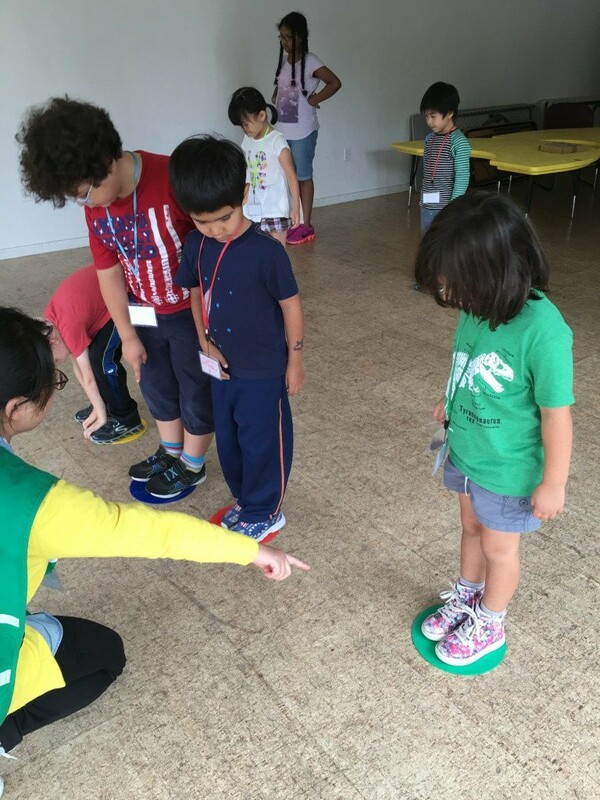 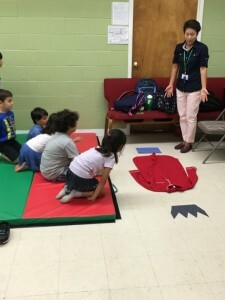 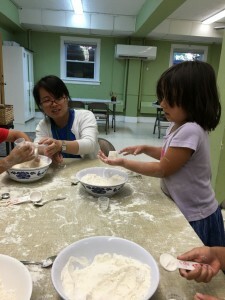 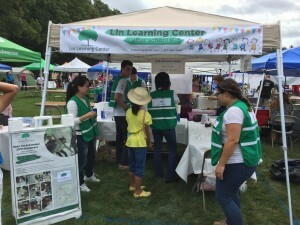 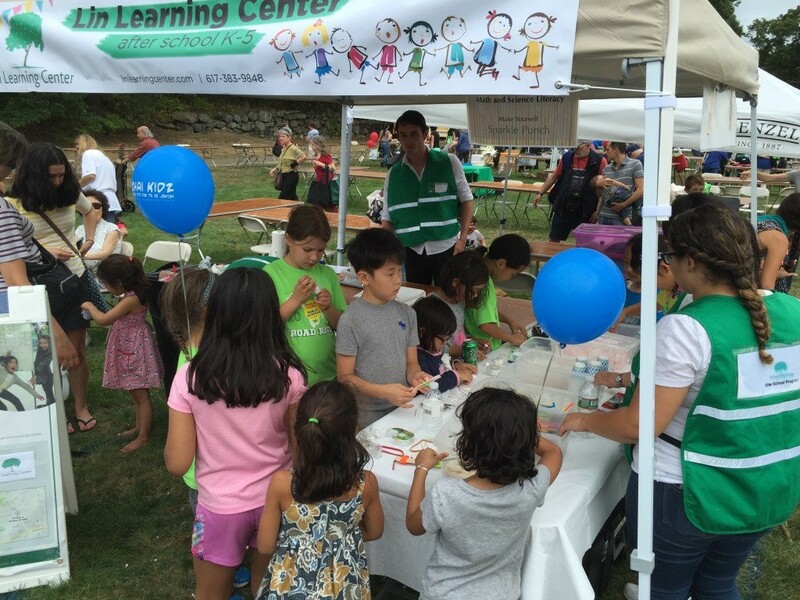 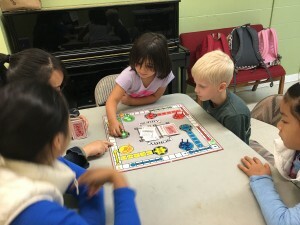 To end the month with a bang, Lin Learning Center participated in Brookline Day this year. 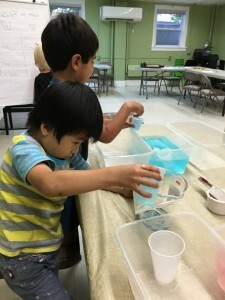 We presented two activities: create something out of open-ended materials and make yourself sparkling punch. 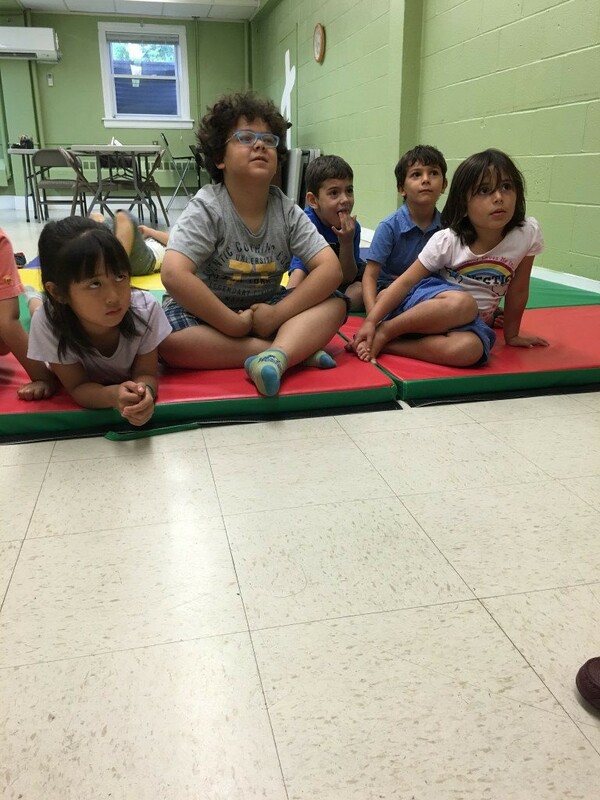 These two stations reflected our center’s philosophy and the type of activities we do on a regular basis. Many parents and their children enjoyed participating in them.